Are you interested in protecting our waterways? Are you interested in what you can do to make a difference? 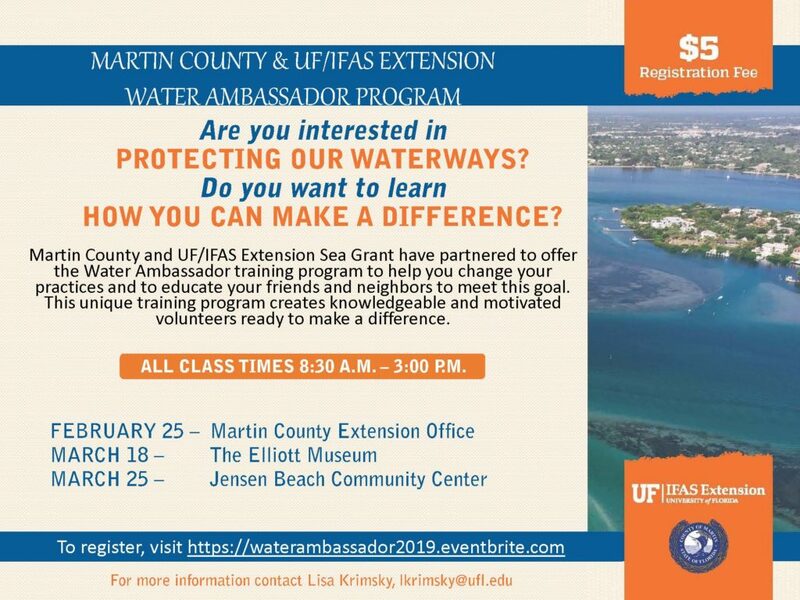 Martin County and UF/IFAS Sea Grant Extension have partnered to offer the Water Ambassador training program to help you change your practices and to educate your friends and neighbors to meet this goal. This unique training program creates knowledgeable and motivated volunteers ready to make a difference. What is the Martin County Water Ambassador training program? The Martin County Water Ambassador training is a one day education program that unites and empowers residents and volunteers who have an interest in protecting local waterways and giving back to their communities. The program provides a way for motivated individuals to connect personal decisions with information about lagoon -friendly practices. As a Water Ambassador graduate, you take on the role of educator and activist within your community. Water Ambassadors work in the following areas to advance the message of reducing pollutants in runoff and encourage residents to answer the call to help protect our local waterways!